← Happy Chick Lit May! Vote for Miss Chick Lit 2015 — and win a free makeover! Welcome to the 2015 Miss Chick Lit pageant, where literary ladies from around the globe compete for the coveted title! Up next is Rapunzel Delmonico from the illustrious United Kingdoms of Marestam. So grab your cocktails, strap a seatbelt on your men, and prepare to be enchanted! Greetings all. My name’s Rapunzel and I’m here thanks to too many martinis and an ill-conceived bet with some of my girlfriends. (I’m looking at you, Cinderella.) Not that I mind strutting around in a swimsuit in front of a few dozen cameras or anything … I just don’t need the validation. But let’s make the best of it, shall we? Yes, I’m that chick from the tower. No, my hair is not thirty feet long, but it does change color and style roughly three times a week. As an infant, my parents sold me to a witch for drugs, so I don’t know where I actually came from. But now I live in a fabulous bachelorette pad on the Upper West Side of Carpale. And if you didn’t already know any of those things, you don’t pay much attention to the gossip pages. I chose this little number because it’s a kinda funky, kinda flirty, and it was the first one to catch my eye. Funny story. I was all ready to drop some drawer—haha, I mean, some jaws—with a gravity-defying acrobatic spectacular. But somebody spotted my prop box just now and made a ruckus with the censor board. So instead, you lucky kids get to see the swimsuits I picked for my five closest gal pals. Please keep in mind I went by their tastes, not my own. Interview: What is the best compliment you’ve ever received? Best compliment? Well, there was the time I got two marriage proposals—via skywriting—on the same day. Some people would consider that a compliment. And the owner of Carbury Diamonds once said my eyes put his flagship showroom to shame. That was pretty cool. But I’ll never forget picking up the Marestam Mirror last Halloween and seeing a ten-year-old girl dressed as yours truly. There she was … in a sea of princesses, Cinderellas, and pureblood fairies … wearing a lavender wig and a naked left ring finger. She told the reporter that she wanted to be editor-in-chief of a news company someday, and that she didn’t need a crown or a man to define her. I almost cried. Let’s get a hand for Rapunzel Delmonico, everyone! For more about her and her friends, check out the Amazon bestselling series, Desperately Ever After. 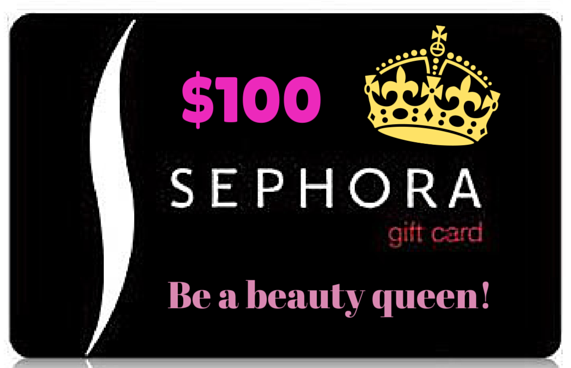 You can be a beauty queen too with this $100* gift card! To enter, take a crack at Rapunzel’s interview question using the comment section below. Remember to include your email address so we can contact the winner. Then follow the links to the other pageant contestants’ pages for a grand total of 19 chances to win! Awesome! I loved it! I’m not entering, but the best compliment I ever received is hard because what makes it “the best” compliment? Writing-wise, someone compared my style to Emily Giffin and another Marion Keyes. I’ll take it! Best compliment I have ever received was about my writing. Hands down. Also I have read Laura’s books and they are fantastic! That yellow and white suit is to die for! Also, hair changing color three times a week? I LOVE IT. It IS cute, right? Almost makes me want to go swimsuit shopping. Almost. That I am an amazing single mom! Only my favorite because of how ridiculous it is! Thanks Tracie 🙂 I totally wish I could pull Rapunzel from the page and hang out with her. Awesome post! 🙂 Love that collection of fab swimsuits!! There isn’t one specific compliment that stands out in my mind. It always makes me happy to be complimented on doing well on something that I spent my time and passion creating. I love when I get compliments on my blog from a post I wrote, or an author appreciating my review of their novel. I’m involved with that I create a monthly and quarterly newsletter for and I love getting compliments from the ladies that love the newsletter. It makes me incredibly happy to know that people like and appreciate what I do. I’ve received some great compliments on my blog and it always means a lot to me. That’s a rare and wonderful quality! I loved your books! Rapunzel is spot on with those bathing suit choices… There is a 3 Way tie for my greatest compliment? “You can throw a disk like a dude, Mom.” My son likes to toss the frisbee with me! “Mama! You look hot!” (my teenage daughter – I’ll take that) and my husband, who tells me he loves me everyday. Those are all top notch compliments, Celia. You’re very lucky!! I’ve been complimented on my hair a lot. We have that in common 😉 Though I used to hate it! My niece told me I am a wonderful Aunt! Hi three things 1) addicted to the books 2) where can I get the white swimsuit art cin and 3) when is the next book coming out? Thanks so much, Abena! I’m so glad you’re enjoying the series 🙂 I don’t have a solid release date yet for Book 3, but you can expect to see it by the spring — as well as a few short stories and novellas in the meantime. As for the swimsuit, the link describes it as Agent Provocateur Mazzy Cutout Triangle Bikini Top. Hope that helps! !